Knesset lobby pushes government to reject any restrictions on construction in Judea and Samaria proposed by the Trump administration. 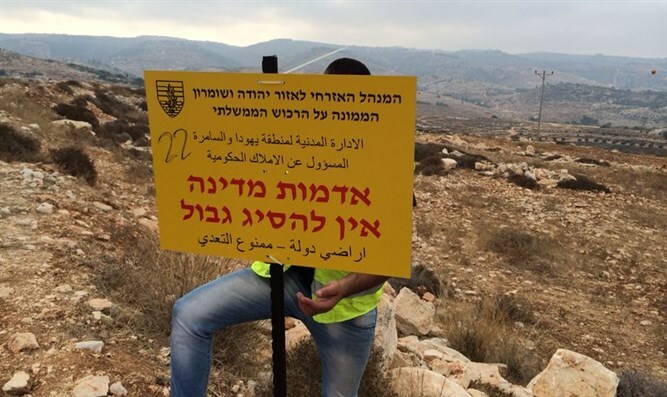 The Civil Administration began the process of declaring land near the town of Eli in Samaria as state land, Haaretz reported. According to the report, nearly 980 dunams (245) acres will be declared state land. In addition, 2,000 apartment units which had been delayed were released to begin the planning process. Meanwhile, the ministers of the Security Cabinet met Thursday evening and received an update from Prime Minister Binyamin Netanyahu on the negotiations with the Trump Administration on a mutually agreed upon formula for Jewish construction in Judea and Samaria. The leaders of the Knesset's Israel lobby MK Yoav Kisch (Likud) and MK Bezalel Smotrich (Jewish Home) appealed to Prime Minister Netanyahu and the ministers of the Security Cabinet to refuse any restrictions on construction which the Trump Administration might propose. "The freeze is illegitimate, not even 'in the meantime' or as an 'interim stage,' and certainly no freeze or construction restrictions outside the blocs [is legitimate]," Kisch and Smotrich wrote in a letter to the Cabinet. "The bloc plan is the plan of the Palestinian state and there is no justification for a right-wing government to accept it, even if it is only temporarily or partially [accepted]."